Laura Strickland’s new historical romance book Daughter of Sherwood, published by The Wild Rose Press, will be released on November 1, 2013. Sometimes greatness is thrust upon us. Wren never knew about her famous father until now nor could she imagine the adventure that awaits her. Full of magic, mystery, and intrigue this is a page turner you will not want to miss. The author did a great job of keeping with the original image of Robin Hood while adding her own unique spin to the tale. I had a great time reminiscing about old characters and meeting plenty of new ones along the way. Wren is courageous, headstrong, and as beautiful as she is kind. I really admired in ability to take things in stride and her willingness to sacrifice for the good of everyone. She is a beautiful character both inside and out and someone I would love to have as a friend! There are also two new characters that were both so fun to read about. The first is Martin who is a potential love interest. He is brave, strong, and charming. However, his motives are uncertain and he has many secrets that may or not be harmful to Wren. The second, and my personal favorite, is Sparrow. He is the kind, thoughtful, and friend that Wren can turn to for anything. I loved reading about him and really enjoyed his sweet nature. He was also very brave and would do anything for Wren. Romance wasn't the only thing on their minds however. There were still many dangers that Wren needed to face. The hardest part would be figuring out who was friend and who was foe. 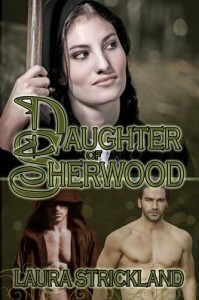 For a romantic and heart pounding adventure check out the "Daughter of Sherwood".